Saying sorry isn't sad, it's a super power. Many moons ago, I looked at some couples, and wondered how they got by when one of them, (sometimes both of them!) could not say “I am sorry”. Is it that hard? Apparently it is. I believe decisions boil down to two things, Love or Fear. 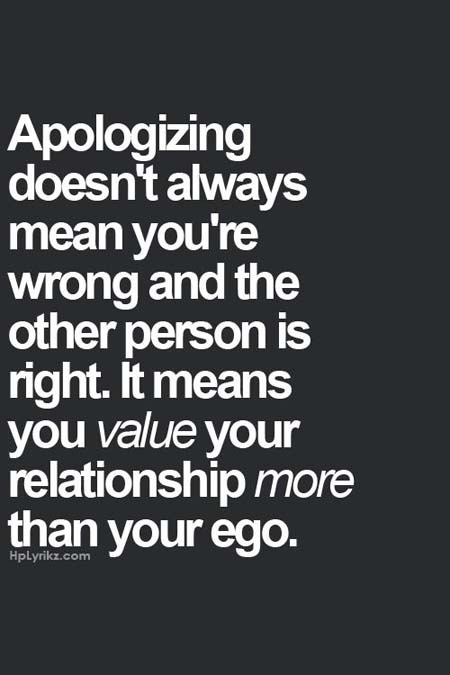 The thing is, saying “I am sorry” isn’t just for couples. We have to learn to apologize beyond friends and family, we must also learn to apologize to colleagues, peers and strangers. What are some of the things that stop us from saying sorry? 1. Admitting we made a mistake. If we don’t make mistakes how do we learn from them? Sometimes you really do have to burn your hand on a hot pan to know to always use an oven mitt! 2. Our ego and the fear of looking foolish. No one wants to look like a fool. The truth is though you look more foolish if you can’t admit when you were wrong! The best leaders are often the ones who admit, “I don’t have all the answers!” and are first to fess up to a failure. Why should we say sorry? 1. Saying sorry dissolves blame and it often helps you move on to the real issue. If you had a fight over forgetting to pick up milk again, and the real issue is you are overworked and burning out, the milk is the least of your worries! 2. It’s one word that can show you care. It’s just a word?! A big word that means, my relationship with you is more important. Even if something is not your fault it can indicate that you value the relationship more than your own self importance. 3. You are doing your part. Asking for forgiveness means you are able to acknowledge there is a problem here which you are part of, even if it’s not your “fault”. Every relationship involves the transmission of messages between people. If you are having a disagreement and you apologize you are acknowledging somewhere within the relationship there was a breakdown in transmitting intention or communication with that person or your better self. 4. The only way is up! Once you have said sorry, you are leveling the playing field at least on your end. If you are apologizing, even if there is anger on the other side and resentment it is the beginning of your attempt to reconcile.